The Alert Settings tab lets you specify the alerts that you want to see on your Zoom Room screen, as well as the settings that generate an email that is sent to a specified email address of a person or group who can respond to the alert. Disable the options on the Client Alert Settings section if you are using the Zoom Room to view content rather than present content. This prevents the alerts for microphone, speakers, and camera from displaying on the screen. If you leave these options enabled, the room can become disabled if those peripheral devices are disconnected. Sign into your Zoom account as a Zoom Rooms administrator. Click Zoom Rooms, and then click a location in the room hierarchy that you want to adjust. For example, if you want the same alert settings for all rooms on a particular floor, click the Floor name in the hierarchy. Update any settings (as long as they have not been locked at a higher level of the hierarchy), to enable or disable an alert, then click Save Changes. The Client Alert Settings section includes alerts that display on the TV screen of the Zoom Room. 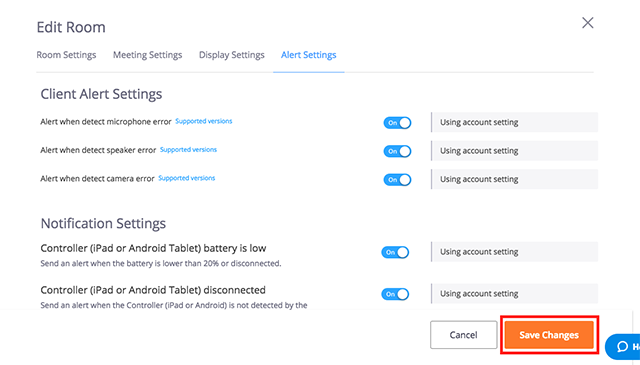 Disable these settings if you have deliberately disconnected one or more peripheral devices or have never enabled them. For example, if you are using the room only to attend meetings or webinars in which no one in the room will need to speak or be seen, you can disable the alerts for microphone errors or camera errors. If these alerts are enabled, the room cannot be used until the peripheral devices are connected. The Notifications Settings section includes the circumstances in which the room sends an email to the support team to notify them of a potentially urgent issue. These issues can affect the operation of the room, but do not display on the TV screen. The email alert is sent to the email address specified in the Notification Email Recipients section. Emails are sent from no-reply@zoom.us. A notification is sent when Mac mini has stopped sending heartbeats to our cloud server. Click Add New to enter the email address of someone you would like to receive the notifications.